an abnormal narrowing or contraction of a body passage or opening; called also arctation, coarctation, and stricture. aortic stenosis obstruction to the outflow of blood from the left ventricle into the aorta; in the majority of adult cases the etiology is degenerative calcific disease of the valve. hypertrophic subaortic stenosis (idiopathic hypertrophic subaortic stenosis) a cardiomyopathy of unknown cause, in which the left ventricle is hypertrophied and the cavity is small; it is marked by obstruction to left ventricular outflow. mitral stenosis a narrowing of the left atrioventricular orifice (mitral valve) due to inflammation and scarring; the cause is almost always rheumatic heart disease. Normally the leaflets open with each pulsation of the heart, allowing blood to flow from the left atrium into the left ventricle, and close as the ventricle fills again so that they prevent a backward flow of blood. In mitral stenosis there is a resultant increase of pressure in the pulmonary artery and hypertrophy of the left ventricle. The usual treatment is surgical replacement of the valve. pulmonary stenosis (PS) narrowing of the opening between the pulmonary artery and the right ventricle. pyloric stenosis see pyloric stenosis. renal artery stenosis narrowing of one or both renal arteries by atherosclerosis or by fibrous dysplasia or hyperplasia, so that renal function is impaired (see ischemic nephropathy). Increased renin release by the affected kidney causes renovascular hypertension, and bilateral stenosis may result in chronic renal failure. spinal stenosis narrowing of the vertebral canal, nerve root canals, or intervertebral foramina of the lumbar spine, caused by encroachment of bone upon the space; symptoms are caused by compression of the cauda equina and include pain, paresthesias, and neurogenic claudication. The condition may be either congenital or due to spinal degeneration. subaortic stenosis aortic stenosis due to an obstructive lesion in the left ventricle below the aortic valve, causing a pressure gradient across the obstruction within the ventricle. See also idiopathic hypertrophic subaortic stenosis. subglottic stenosis stenosis of the trachea below the glottis. A congenital form results in neonatal stridor or laryngotracheitis, often requiring tracheotomy but resolving with age. An acquired form is caused by repeated intubations. tracheal stenosis scarring of the trachea with narrowing, usually as a result of injury from an artificial airway or trauma. tricuspid stenosis (TS) narrowing or stricture of the tricuspid orifice of the heart, a condition often seen in patients with severe congestive heart failure, usually the result of volume overload and pulmonary hypertension with right ventricular and tricuspid annular dilation. pathologic narrowing of the aortic valve orifice. a narrowing or stricture of the aortic valve. Common causes include calcification of the valve because of age, congenital malformations such as bicuspid or unicuspid valves, or direct damage to the valve from rheumatic fever, which leads to fusion of the cusps. Aortic stenosis obstructs the flow of blood from the left ventricle into the aorta, causing decreased cardiac output and pulmonary vascular congestion. It may lead to congestive heart failure. Clinical manifestations include faint peripheral pulses, exercise intolerance, angina-type pain, syncope, and a harsh midsystolic murmur often introduced by an ejection sound. Diagnosis is confirmed by cardiac catheterization or echocardiography. Surgical repair may be indicated. Surgery is followed by frequent examinations because prosthetic valve dysfunction and bacterial endocarditis are relatively common sequelae. Children with aortic stenosis are usually restricted from strenuous activities. See also congenital cardiac anomaly, valvular heart disease. A condition characterised by narrowing of the aortic annulus due to degeneration and calcification of the valve leaflets; AS is more common and occurs earlier in patients with underlying valve defects (e.g., bicuspid valves). Aortic stenosis in previously normal valves develops after age 60 and is associated with HTN and hypercholesterolaemia. Rheumatic fever, congenital heart disease, idiopathic sclerosis. Systolic ejection murmur radiating to the neck. In mild stenosis, the murmur peaks early in systole and is often associated with a thrill; with increased severity, the murmur peaks progressively later in systole and may become softer as cardiac output decreases. Angina, syncope, congestive heart failure (CHF). Chronic stenosis leads to LV enlargement and CHF. Pressure gradient is related to valve area 6mm Hg at 2cm2 and 26 mm Hg at 1cm2, but 105 mm Hg at 0.5 cm2. Doppler echocardiography indicates increased flow rates and decreased total flow; catheterisation; coronary angiography. If asymptomatic, none needed except for prophylactic antibiotics to cover for infective endocarditis; valve replacement surgery; balloon valvotomy is only palliative. Cardiology Narrowing of the aortic annulus caused by degeneration and calcification of the valve leaflets; AS is more common and occurs earlier in Pts with underlying valve defects–eg, bicuspid valves; AS in previously normal valves develops after age 60 and is associated with HTN and hypercholesterolemia Etiology Rheumatic fever, congenital heart disease, idiopathic sclerosis Clinical Angina, syncope, CHF Hemodynamics Chronic stenosis leads to LV enlargement, CHF Examination Systolic ejection murmur radiating to the neck; in mild stenosis, the murmur peaks early in systole and is often associated with a thrill; with ↑ severity the murmur peaks progressively later in systole, and may become softer as cardiac output ↓ Diagnosis Doppler echocardiography indicates ↑ flow rates and ↓ total flow; catheterization, coronary angiography Management If asymptomatic, none needed except for prophylactic antibiotics to cover for infective endocarditis; valve replacement surgery; balloon valvotomy is only palliative. Cf Aortic regurgitation, Pulmonary stenosis. Pathologic narrowing of the aortic valve orifice, blocking blood flow from the left ventricle, thus decreasing cardiac output. A stiffening of the artery which carries blood from the heart to the body. narrowing or contraction of a body passage or opening. See also specific anatomical sites. obstruction to the outflow of blood from the left ventricle into the aorta. May be due to an anomaly of the valves (valvular), an obstruction in the ascending aorta (supravalvular), or an obstruction in the left ventricular outflow tract (subvalvular). See also aortic subvalvular stenosis, aortic valvular disease. a common cause of esophageal obstruction, caused commonly by esophageal trauma; congenital stenosis often associated with tracheoesophageal fistula. 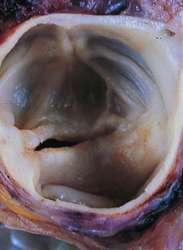 see mitral stenosis (below), valvular stenosis. occurs as stenosis of the ductus deferens or epididymis; may be associated with renal aplasia. a narrowing of the left atrioventricular orifice. See also mitral commissurotomy. an acquired disorder in cats, usually following chronic upper respiratory infection, which causes upper airway obstruction with mucopurulent nasal discharge and a wheezing respiration, which is relieved with open mouth breathing. focal defects in the duct lead to segmental aplasia or stenosis of the uterine tube or horn. the commonest cardiac defect in dogs; it is a narrowing of the pulmonary outflow tract and may occur in any one of a number of common sites including infundibular, valvular and subvalvular. has the effect of reducing air flow into and out of the lungs. narrowing or stricture of the tricuspid orifice of the heart. Q. How does alcohol affect someone who has been diagnosed with aortic valve stenosis? My brother has been diagnosed with aortic valve stenosis and also is a smoker and does drink alcohol on the weekends. He knows that he should stop smoking but what about the effects of alcohol? Does this also contribute to his stenosis? A. Alcohol changes blood pressure and speed of the heart- that is not a good idea if you have an Aortic stenosis. Could probably makes things worst. I would avoid alcohol… but he should ask GP. this is called Left Ventricular Hypertrophy or LVH in abbreviations. this is a classic LVH E.C.G. This report draws the attention to a rare presentation of aortic stenosis due to the effects of hypothyroidism on cardiac function and morphology, which reinforces the importance of fully investigating other potential comorbidities when an unusual clinical scenario is documented. She had fusion of the right and the non-coronary cusp but had a combination of severe aortic stenosis and moderate aortic regurgitation. Diagnosis and management of valvular aortic stenosis. Caption: Aortic stenosis occurs when the aortic valve's leaflets calcify and narrow the valve opening, affecting valve function. The most widely used measures of aortic stenosis severity in clinical practice are the peak aortic velocity and the aortic valve area, as determined by the continuity equation. Aortic stenosis in young rats leads to early left ventricular hypertrophy, gradual ventricular dysfunction, and heart failure, similarly to human chronic pressure overload. Christa Gohlke-Baerwolf of Bad Krozingen (Germany) Hospital mediated the dispute and closed discussion by observing, "Severe aortic stenosis is not just one thing, it's a continuum, and such patients should be evaluated by a multidisciplinary team very carefully before starting pregnancy. In our patient selection and study protocol clinics, bileaflet mechanical prostheses were implanted in 22 patients (10 male, 12 female; mean age 27+-8; range 19-43) who were diagnosed with pure aortic stenosis or stenosis and regurgitation between January 2009 and September 2011. One in 20 people over 65 have a degree of aortic stenosis. Minneapolis, MD, announced it has received the CE (Conformitre Europeenne) Mar, of the Engager Transcatheter Aortic Valve Implantation (TAVI) System with transapical deliver catheter to treat patients with severe aortic stenosis who are at high or extreme risk for surgical aortic valve replacement (SAVR). This is an important step forward in understanding the biology of the development of aortic stenosis," said senior author Wendy Post, from the Johns Hopkins University School of Medicine. Calcium buildup is the most common cause of aortic stenosis, a narrowing of the aortic valve that can lead to heart failure, stroke, and sudden cardiac death.